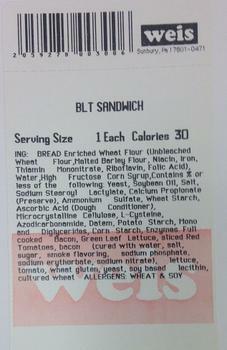 Weis Markets is recalling its store-made bacon, lettuce and tomato (BLT) sandwiches. The products contain egg-based mayonnaise, an allergen not declared on the label. One customer reported an egg allergy reaction after eating the recalled sandwich. The recalled product, packaged in a clear plastic sandwich container, was sold in Weis Markets’ delis in the company’s 204 stores in Pennsylvania, Maryland, Virginia, New Jersey, New York, Delaware and West Virginia.